Peckham to The Tower. May 27th. 12 riders at Peckham Square on a dry, bright, day. Off down the Canal Path, then round Burgess Park and down the Walworth Green Link to New Kent Road and the Elephant. Across the peninsula to CS6 and down to and across Blackfriars Bridge. Onto the Embankment and the E-W Superhighway, following this to the Tower. Very short break at the Tower, then continued to Cable St and the start of CS3. Next turned south to Hermitage Riverside Memorial Garden where we have a break. Good to see the house martins back and nesting just upstream. Next through St Katherines Docks and back via Tower Bridge, Bermondsey Spa Gardens, Willow Walk and the Canal Path. With a relatively small group, made good speed and were back 10 minutes early. 10 miles, no hills (unless you count Tower Hill). Route at https://goo.gl/Iq8s5j. Repeat of a ride we have done a few times, usually, as this time, led by Philippa. Here is her report. 18 and a half (1 x child carried) of us set off from Canada Water in somewhat mixed weather a bit blowy and the sun not being very cooperative. Out on NR4 to Blackfriars Bridge then on the Superhighway across the bridge and onto CS7 to Westminster through Parliament Square down to Millbank and then picking up NR4 to Battersea Park. Coffee and pastries then back southside of the river past the rapidly progressing redevelopment of Battersea Power station to Nine Elms then back on the cycle path (when we got past the sealed off bits being done up) to Westminster Bridge. 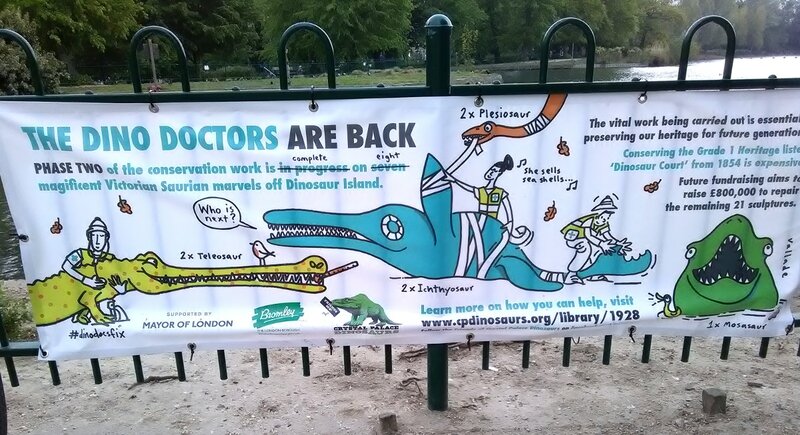 Back through Waterloo station down the Cut and Union St down to Q1, then LCN22 back to Southwark Park and our start at Canada Water. 13 riders set out on an overcast day with a bit of rain about (but never materialised). Joined Nat Route 4, soon to become also Quietway 14, at Albatross Way and followed this to the Brunel Tunnel. Then took the slightly more inland route proposed for Q14 to the Angel where we continued along the Thames-side NR4 route. Brief stop at the Tideway works at Cherry Garden Pier. A new piece of London has now been created by extending the bank of the Thames by 50 m and filling in the space. Understand when the works are complete this new land will be removed! At Dockhead left NR4 and followed the new Q14 proposed route via Tanner St. At Snowsfields, beside the new Guys Cancer Centre, the road is now 1-way with a cycle contraflow lane. The priority at the Crosby Row junction has been changed to give the straight on traffic (i.e. Q14) right of way. No work yet on the modal filter at the Newcomen St, Borough High St junction. Into Union where the first stretch of improved contraflow cycle lane has been finished. At Southwark Bridge Rd, no new crossing or modal filter although these are promised. Short segregated contraflow lane on Chancel St has been widened and now just has light segregation. Q14 present route plans end at Blackfriars Rd. We joined the cycle superhighway north and headed along Upper Ground to the South Bank. Brief stop to discuss the demise of the Garden Bridge (not much lamented). Picked up Q1 at Cornwall Rd. Back along a now well-established route where it was nice to see a bit more signage. At the Millwall path were well ahead of schedule, so most took a loop sightly eastward down Surrey Canal Rd, across Deptford Park and into the new development between Oxanstalls Rd and Plough Way. Here a delightful new path has been created linking the two roads along the alignment of the old Surrey Canal. Appropriately called the Surrey Canal Linear Path. Only 400m, but very nicely landscaped. And with a new cafe that has our favoured Italian pastries. Route at https://goo.gl/zDxw34 , or the gpx file on right. 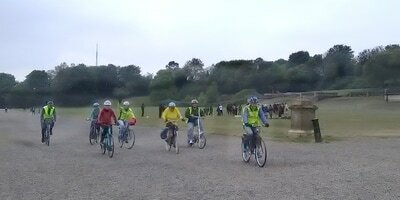 19 riders set off from Cutty Sark on a cool, dry morning. Followed the Thames to Woolwich where another 2 joined the ride. On to the ferry for the short ride across to North Woolwich - the first time that I can remember when the Healthy Riders went to sea! From North Woolwich around the east end of the Royal Docks, through the University of East London campus and eventually to the Greenway. At Abbey Mills turned on to a small, rough path through to Three Mills and the river Lea. Downstream to Bow Lock, over the new bridge and the short distance to Cody Dock. Cody Dock cafe was open and considerable use was made of this. The planting, and the large artificial flowers, were admired. Managed to finally drag people away and head down the Limehouse Cut and west side of the Isle of Dogs. Back at the Greenwich foot tunnel at 1.04pm after a fascinating ride. Terrific route worked out by ride leader Amanda (https://goo.gl/iWFw6t). April 22nd, 10am to 12 noon. 21 riders in Peckham Square in really nice spring sunshine. Off we headed up Rye Lane and on to Nunhead. Through the cemetery, the first of four. Next across the top of Peckham Rye Park and on to Camberwell Old Cemetery and the Horniman Museum. Brief stop, then back along the narrow path along the west side of Horniman Gardens. This was easier than the last time we tried - the recent dry weather helped and the verges were not too overgrown. Next stop Camberwell New Cemetery and over the railway on the foot bridge between Turnham Rd and Dalrymple Rd. There is an unusual barrier on the Dalrymple side (see photo). You duck through an arch - probably a quicker way than the usual parallel barriers. Our last cemetery was next, Brockley and Ladywell. We entered from Brockley Rd and followed a meandering path through trees. The leaves were a magical fresh green in the sunshine. The cow parsley formed a waist high canopy under the trees. Entrancing. Next up Hilly Fields and down the other side to Brockley Station. Over the foot bridge and up to Nunhead again. No time for Telegraph Hill, straight down to Queens Rd Station. This will be the start of the Peckham Coal Line, a local scheme to open up a foot/cycle path from there to Peckham Rye Station. From Queens Rd we backtracked to Bidwell St where the Coal Line folk were setting up an Event. 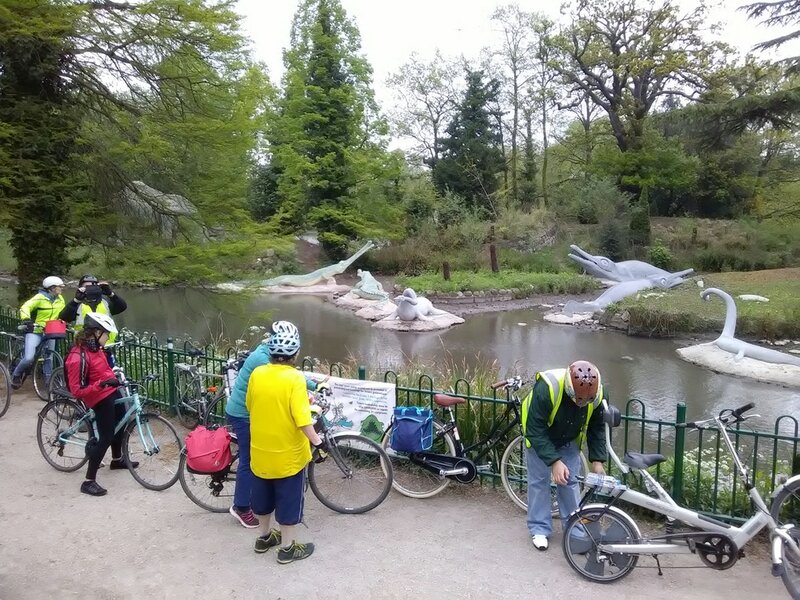 (We returned later to admire their model of the route, currently the subject of a crowd-funded feasibility study (Southwark Cyclists contributed)). Then back to Peckham Square pretty much exactly on time, despite packing a lot into the ride. Only one museum, but 2 parks and 4, yes 4, cemeteries! Route at http://goo.gl/XzFkTD. 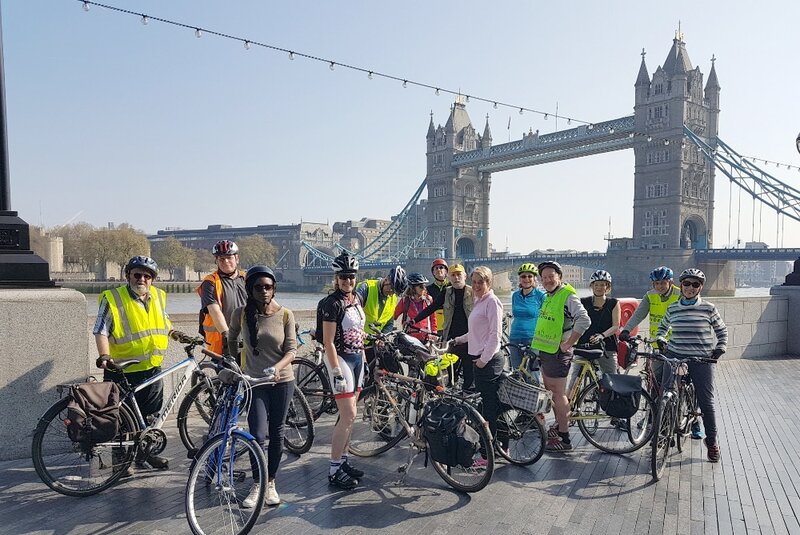 14 of us set off from Canada Water on a glorious, sunny day heading up NCR 4 along the Thames Pathway crossing Tower Bridge and then into More London by the new County Hall. 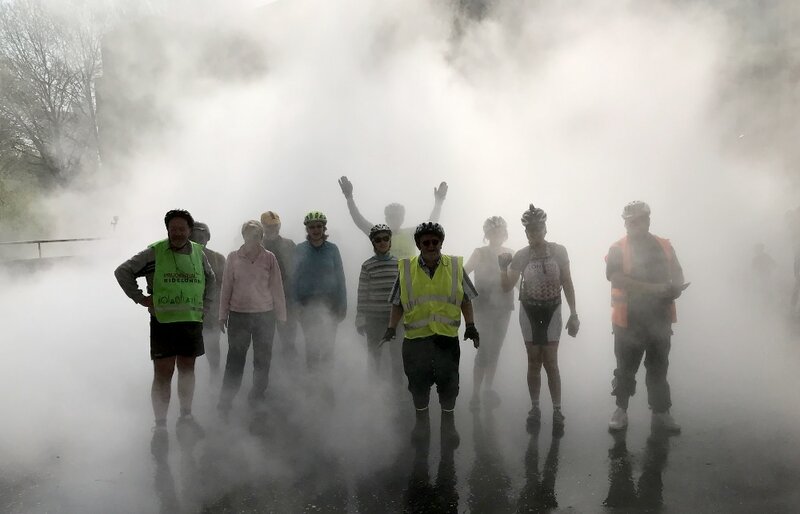 We stopped for a group photo but then were accosted by one of the security guards informing us that it was private property and the owners 'preferred that there was no cycling to stop people being mowed down'. We challenged the lack of signage barring cycling and evidence of pedestrians being injured. Anyway to keep the peace, and as he followed us, we walked to the edge of his area and then rode on. We paused at the new extension to Tate Modern as there is a dry ice installation there. We couldn't resist another group photo! Then on past the Southbank Centre to the London Eye - 3rd group photo. 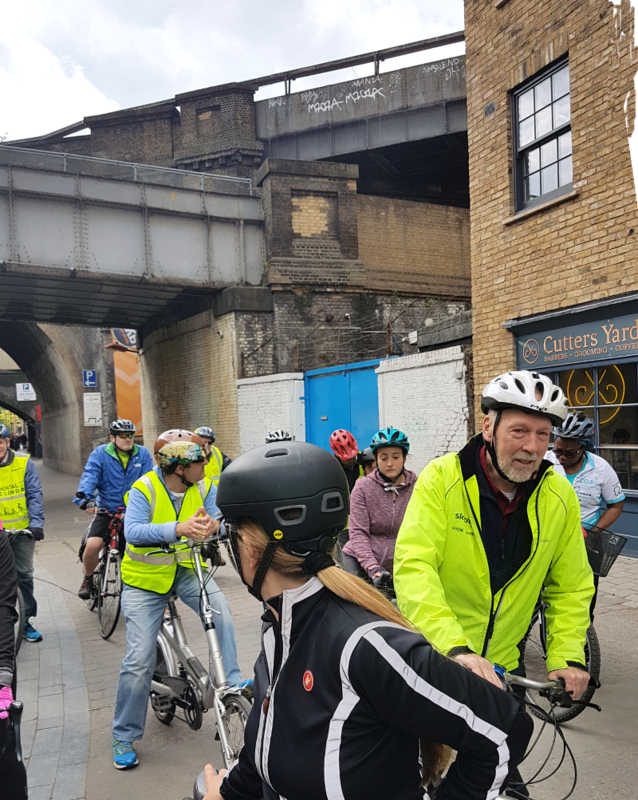 We returned through Waterloo station down the Cut into Union Street then down to Great Suffolk Street to pick up Q1 until peeling off onto LCN 22 back to Southwark Park and returning to Canada Water. Report from Philippa who was Ride Leader. Photo op like a bunch of tourists! 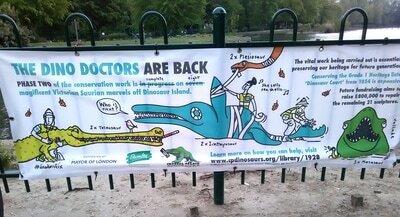 Dulwich Park to Clapham Common April 1st. 10am to 12 noon. Just 8 riders at the Pavilion Cafe in Dulwich Park for the first of a planned series of rides from there. Sunny and mild, so clearly need to get some publicity out to get the numbers up. Headed off for Herne Hill Velodrome which was full of activity. Were able to go into the newly finished Pavilion. Really smart and Jan's Cafe was in full operation. Downstairs loos and changing rooms. The back area next to the Pavilion has also been tidied up. All the containers re-arranged and a smart stretchy fabric roof to keep people dry while sorting out bikes.